After a detour to Ullapool to buy some gas, Ben and I set off walking from Corrie Hallie at around 11:30am. 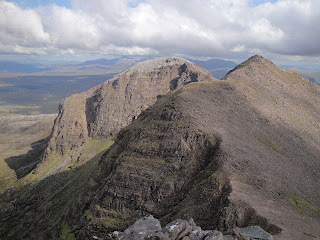 It was hot and sunny as we ascended through the woods of Gleann Chaorachain with views across to An Teallach, which looked very impressive. Soon after leaving the woods we turned right off the vehicle track onto a smaller, but good, path. This we followed, skirting the SE ridge of Sail Liath before dropping down into Strath na Sealga to Shenavall bothy. After dropping off our overnight kit and having a late lunch in the sunshine outside the bothy, we set off walking again soon after 2:30pm. We retraced our steps for 1.5km before starting to ascend up the SE ridge of Sail Liath. There were good views east towards the Beinn Dearg group of hills and the Fannichs. We reached the summit of Sail Liath (Munro Top) at approx 4:30pm and admired the excellent views of the Corrag Bhuidhe ridge. By now it had got quite windy and the sky had mostly clouded over but it was still dry. After going over another Munro top, Stob Cadha Gobhlach, we sought out some easy scrambling on the initial ascent of Corrag Bhuidhe (Munro Top). We soon reached the 'bad step' and detoured to the left to climb a pleasant flake, which was tricky to start. 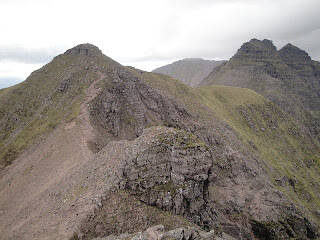 We continued to traverse the ridge with much enjoyable scrambling, tricky in places, before we eventually reached Lord Berkeley's Seat (Munro Top), which was quite airy. 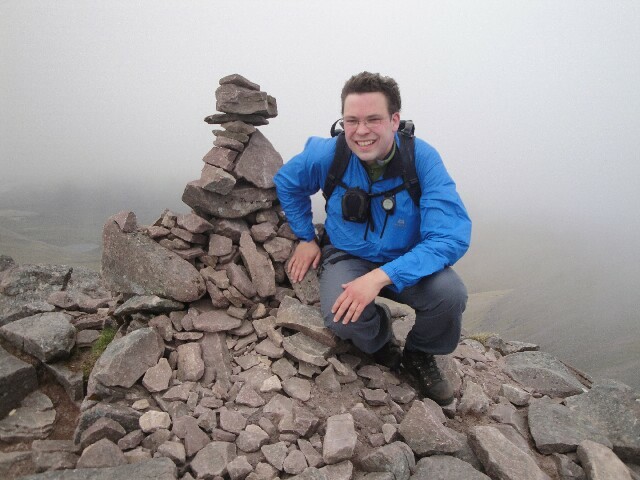 We continued along the ridge and made it to the top of our 1st Munro of the day, Sgurr Fiona, at around 6:30pm. As we were so far north and close to the longest day we didn't have to worry about daylight as there was at least another 4 hours of light left. By now we were in the cloud and the wind had picked up again. 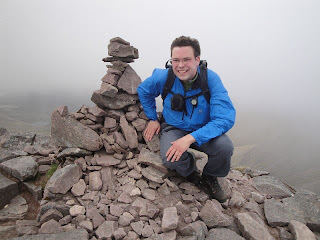 After leaving our bags in the bealach, we nipped up our second Munro of the day, reaching the summit of Bidein a'Ghlas Thuill at around 7:30pm. We retraced our steps back to the bealach before traversing the north side of Sgurr Fiona to reach the bealach on its NW ridge. From here we descended steeply down scree and then grassy & heathery slopes. The cloud-base had clearly dropped as it took a while until we had descended out of the cloud. There was a short section of re-ascent to avoid crossing a deer fence and we then headed for the end of Loch na Sealga. We picked up the path back to Shenavall, where we arrived a little before 10:30pm. The bothy was busy so we pitched our tents for the night.